Before you ask what this is has to do with antisemitism at the Guardian (and you know who you are:), please, dear reader, chill out. As Akus demonstrated, sometime satire, parody, sarcasm, and just plain fun are good antidotes for those of us mired, day in and day out, in the Guardian’s pit of anti-Semitic invectives and anti-Israel calumnies (the tenth, and never published, circle of hell in Dante’s Inferno). Iranian government officials were apparently quite enraged by the revelation that a Star of David can be seen on the roof of the headquarters of Iran Air, the Islamic Republic’s national airline, Al Arabiyya reported on Monday. 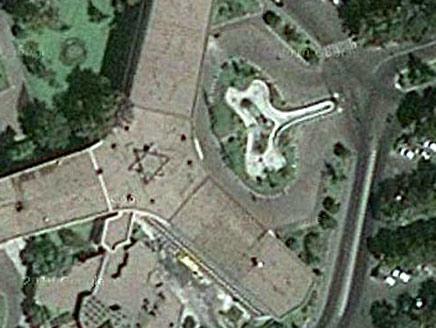 The Star of David was discovered in a satellite image of Teheran’s airport taken by Google Earth. The variety of angles I could attack this story are nearly limitless, but, as other assignments beckon, and this is such low hanging fruit, I’ll simply allow myself a generous dose of Schadenfreude and leave it to you to enjoy in all of its glimmering possibilities. I will only add that – as an Israeli who’s concerned about Iran’s efforts to go nuclear – this story will make me sleep a bit better at night. After all, the Iranian Air building with the offending symbol was built sometime prior to the Iranian revolution in 1979. So, as its taken the Islamic Republic over 30 YEARS to detect a gigantic Magen David on the roof of a high-profile building in their capital, I’m beginning to think that undermining the malevolent designs of our Persian foes may not be as vexing as I originally thought. Very nice indeed Adam. I hope to see extracts from this, as from Akus’s humorous post, all over the blogosphere. I wonder whether there isn’t a little Sabra door there in the middle of the Magen David, that admits Jews into the most secret of the Iranian enclaves. After all, the Iranian Air building with the offending symbol was built sometime prior to the Iranian revolution in 1979. Are you a fan of the Road Runner cartoons? My all-time favourite, as it happens (I prefer my comedy on the subtle side). But apparently they were devised as a plot to undermine Shia Muslims in Iran! Barghouti [no, not that one] represents all the Jordanian people in their rejection of the Zionist state, said Maysara Malas, head of the Higher Executive Committee for Anti-Normalization. 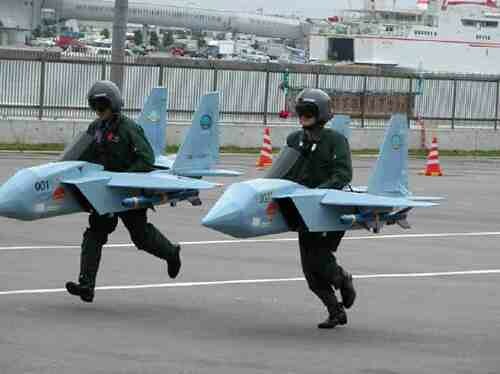 Adam, their planes don’t lift off very far. I think its actually a giant Mazuzah. I mean its on the door to Iran isnt it. Does that make Iran kosher? Pretz, yes, I’m a big fan of the Road Runner cartoons. I really like the idea of the Israeli Road Runner outfoxing the Iranian coyote. (I’m picturing, in this scenario, the coyote attempting to ignite an “ACME” brand nuclear weapon, only to have it blow up in his face at the end.) The possible scenarios are endless. Thanks for the link to the Roadrunner article, which I had not seen. If we had printed that article on CW, there would be an Iranian David Kelly (Daud Kelladenejad)accusing us of making fun of the misery of the Iranians. But I don’t think our imagination stretches as far as investigating the Roadrunner for anti-Shia (or is it Sunni?) activities. From that article: ” have spent millions of dollars researching cartoons such as Coyote and the Road Runner as part of an effort to uncover western plots to overthrow the regime.” When they call him Maddinnerjacket they’re not so far from the truth. See the update to the Elder of Ziyon’s post on this topic. -The character of Wile E. Coyote is a racist and coyotophobe generalisation, describing only a fringe of the coyote society and not mentioning the majority of the coyotes who lived peacefully with the roadrunners during many centuries before the capitalist owners of the ACME company – wishing to increase their profit – started to poison them with their necon tecnological progress and modern weaponry. -Anyway we can’t morally condemn the coyotes – they are only reacting to the colonising white hunters’ actions who are trying to force their moral values regarding the ownership of sheeps upon the traditional culture and religion (of peace) of the ancient coyote society. -the racist hate occasionally voiced by some extremists coyotes against the roadrunners is the logical consequence of the landstealing by these birds from the original owners – the coyotes. No roadrunners lived in the desert before the first screening of the Roadrunner Show – if there is any archeological proof contradicting this – it must be a CIA conspiracy and well funded falsification campaign by the roadrunner lobby controlling the US federal government and Arizona state. pretzelberg – while I do not recall seeing mention of the “Higher Executive Committee for Anti-Normalization.” before, it is quite well-known that there is pressure in Jordan to try to get the government, such as it is, to abrogate the peace agreement with Israel. Same thing in Egypt. There are Israelis who have expressed a wish that Egypt would do it, so that we could take back Sinai when they attack Israel once again, and this time – no giving back. I had a great laugh reading your comment. I am beginning to suspect that your day job is to ghost-write the speeches of Saudi Islamist Sheikhs. Why?